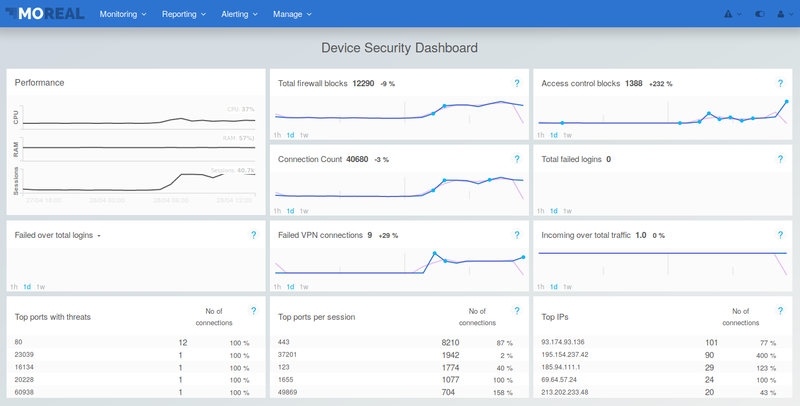 The Device Dashboard breaks down to the lowest network level providing information for a single device. Total firewall blocks: This line-chart displays the number of firewall blocks throughout the selected window (1 hour/day/week). Access control blocks : This line-chart displays the number of denied application-level events as reported in access-control logs throughout the selected window (1 hour/day/week). Total failed logins: This line-chart displays the number of failed logins throughout the selected window (1 hour/day/week). Failed over total logins: This line-chart displays the ratio of the number of failed login attempts over the number of total attempts throughout the selected window (1 hour/day/week). Failed VPN connections: This line-chart displays the number of failed VPN attempts throughout the selected window (1 hour/day/week). Incoming over total traffic: This line-chart displays the ratio of the incoming over total traffic throughout the selected window (1 hour/day/week). Top ports per session: This list displays the top network ports appearing in the network connections along with the number of connections and the difference from previous measurements expressed as a percentage. Top IPs: This list displays the top unique IP addresses in terms of network connections along with the number of connections and the difference from previous measurements expressed as a percentage. Combining information from these widgets can lead to useful conclusions about the device’s security and status.